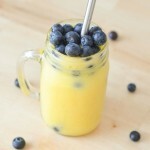 Blend water and orange in a blender until liquified. Add in pineapple, mango and banana. Blend until smooth and top with blueberries if desired.